The safe, definitive solution for permanent tissue augmentation. One of the greatest challenges in plastic and cosmetic surgery of the perioral region has been the search for an exceptional solution to tissue augmentation. Past methodologies, both temporary and permanent, have met with disappointing results for both surgeons and patients. Temporary solutions typically involve the use of commercially produced fillers or autologous fat, which can be unpredictable with respect to how long they last, and require repetitive treatments that are painful, repetitive, and costly. Permanent solutions have relied on implants that may, due to their surface characteristics, promote tissue in-growth. This may result in a restriction of movement and an unnatural appearance. Perma Facial Implant is a patented, FDA approved device designed for tissue augmentation of the face and has undergone extensive clinical testing to ensure its safety and efficacy. Perma Facial Implant is made of a soft, solid silicone elastomer using an injection moulding process to produce a naturally contoured implant with a smooth, non-porous surface. The implant cannot rupture or deflate, and may be removed at any time. Perma Facial Implant is the answer. Perma Facial Implant is not injectable. PermaLip is a soft, solid silicone-based device. 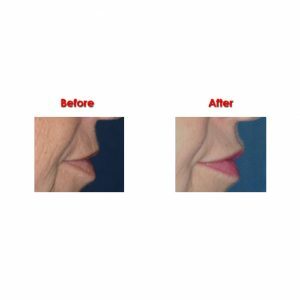 Perma Facial Implant is contoured for a natural appearance. Perma Facial Implant has a smooth surface that reduces the chance of tissue ingrowth. Perma Facial Implant is permanent, yet can be easily removed. The procedure can be performed in a simple office setting under local anaesthesia. 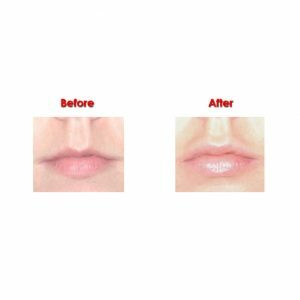 The mouth and lips are locally anaesthetized; then, two small incisions are made in the corners of the mouth. 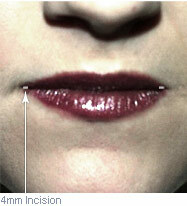 The PermaLip implant is then passed through a tunnel in the lip and centred. The process is repeated for the other lip and the incisions are closed using absorbable sutures. The entire process can take less than thirty minutes and normal activity may be resumed the following day.